It’s shadow loomed impossibly large from the threshold, tumbling over the loose warped wood of the floorboards, swallowing battered tables and splintered chairs within it’s inky bulk. “You hear me? I said we’re closed” repeated, this time with a quiver that couldn’t be mistaken. First, I noticed the cover by Richard Anderson. Then, the blurbs caught my eye: “The Magnificent Seven meets Wind in the Willows” and “The Wild Bunch meets Watership Down”. There’s some truth in those blurbs, but they leave an impression that’s not completely accurate. The book begins with a tough old mouse named The Captain going to one after another of his old gang, telling them it’s time, and where and when to meet. It feels very similar to the first part of the film The Magnificent Seven, with Chris gathering together a group to do a job. It’s well done, and soon we have a stoat, badger, mole, owl and others meeting in a seedy inn, ready to plot and plan. There was a ruler of the prosperous, peaceful land, but upon his death his two sons wouldn’t share the land, each wanted it all for himself. So they began a war, using mercenaries as soldiers. The Elder brother (by a few minutes) won out, but then the Younger staged a coup and took over, the Elder and some of his troops escaping to the southern lands. The Captain led the Elder’s mercenaries, and now he’s gathering the core group for a try at taking the land back. So far so good, and each of the Captain’s group has a specialty; swordsman, crack rifle shot, knife thrower, etc. But the leader of the Younger’s soldiers is also smart, and has his own small group of specialists. 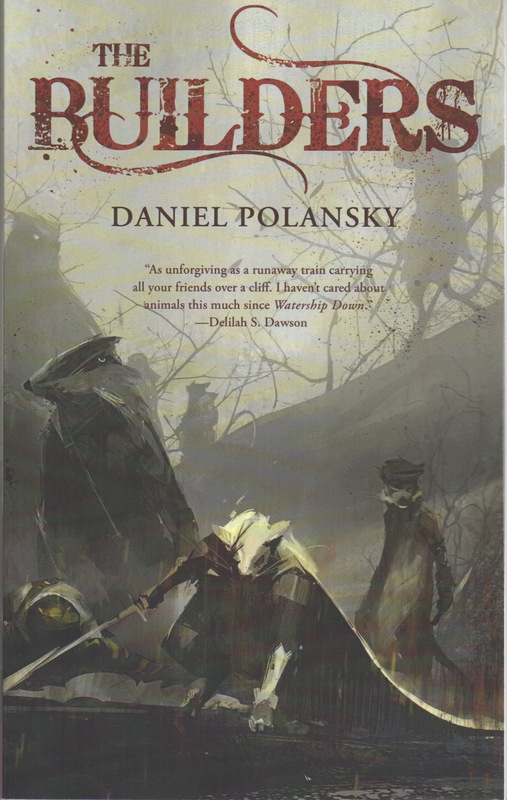 So journeys, tricks, and battles ensue, and I liked many of the characters and the way Polansky portrays them. The book could have used more world building, more depth of setting. It could also have used more depth of plot, and in 218 pages there should have been room for it. I enjoyed this book, and could recommend it except for one thing. It didn’t end, it stopped. Maybe that’s why the book just stops. Maybe the last line of the book was the punch line. I just wish Polansky had taken this story with neat characters, bursting with potential, and given us a real ending. I liked this a lot, until the end. If Polansky picked this back up and carried it forward, I’d be early in line to read what he does with it, as long as he doesn’t try to tell another joke instead of writing a novel, beginning to end. I was less than thrilled with THE MULBERRY BUSH by Charles McCarry, too. Sometimes books just don’t please all readers. Your reaction to THE BUILDERS parallels mine with the McCarry spy novel. George, the books are very, very different. I liked the book,just not the ending. If you can find it at the library, you should give this a try. I would have trouble with this concept. It probably really handicaps my reading. I understand, Patti, this sort of thing isn’t for everyone. It’s a fast go, the pages flew past. I just wish it had been more filled out and…well, I already said what I wish. That said, I think you’ll enjoy it. Send me your snail mail and I’ll send you my copy.